Facebook debuted a new app for smartphones Tuesday, allowing users to send text messages to each other from their smartphones using Facebook’s messaging system. The app in question — Facebook Messenger — is an extension of Facebook’s existing messaging system, which allows two Facebook users to communicate within the Facebook platform. 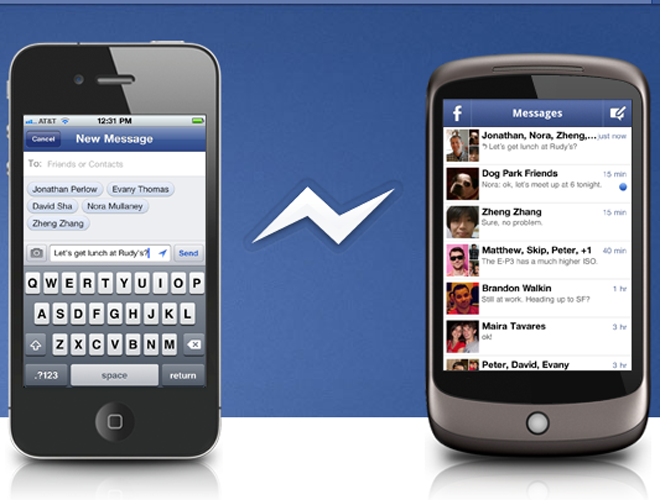 As a standalone program separate from the Facebook app, Messenger allows Facebook users to send text messages between phones, while still storing the conversation in a user’s messaging center on his or her individual Facebook page. Facebook’s Messenger app is also capable of group texting, letting you pick multiple Facebook contacts and send them all texts at once. If a FB user is logged into the new message app, it’ll show up there. If not, they get the message sent to them as an SMS, so long as they’ve registered their phone with Facebook. The service is mobile-focused, so it doesn’t completely integrate with Facebook Messages, which tries to route a message to a person using whatever channel Facebook thinks is most likely for you to get it fastest. Facebook is now letting parents-to-be list their unborn children on their personal profiles. Among options that include daughter, son, wife and husband, the “Friends and Family” section under “Edit Profile” now allows the option “Expected: Child.” Parents can add a due date and the baby’s name. 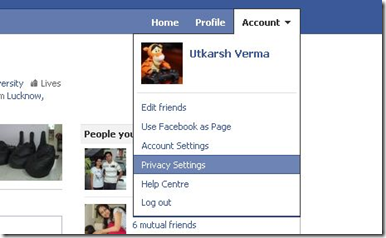 With the feature, the expected child would appear next to other family members on the user’s profile and the changed status would appear in friends’ News Feed. 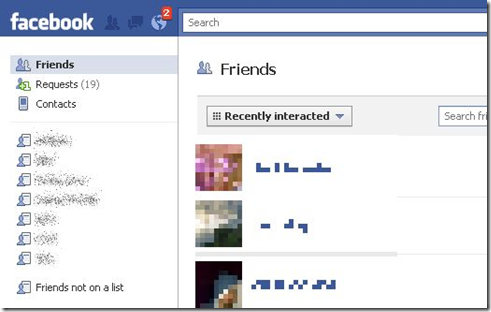 Facebook allows you to share almost anything and everything with your friends. But what if some day you get a friend request from your Boss, you cant say Ignore and you also don’t want to accept. 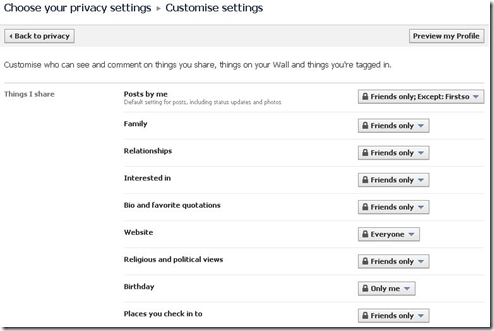 Here comes the role of Facebook privacy controls. You can customize them such that you can have things hidden from who ever you want on an individual or group basis. Controls can be set for individuals but it is better if all the Facebook friends are grouped into various lists as Facebook prefers to call them. Following is a step by step walkthrough to do it. 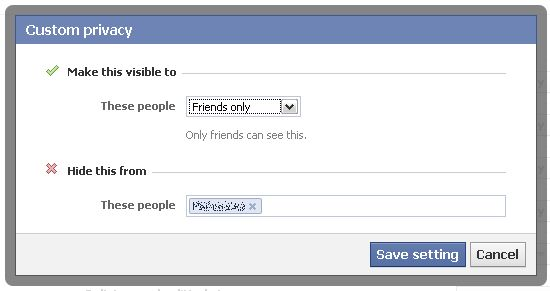 Click the Friends tab on the left column as shown above. This would take you to the all friends list. Click manage Friends List on the top right corner. This would lead to all the lists that you have made of friends, colleagues etc. as shown below. Once you have your lists in place head over to account management. 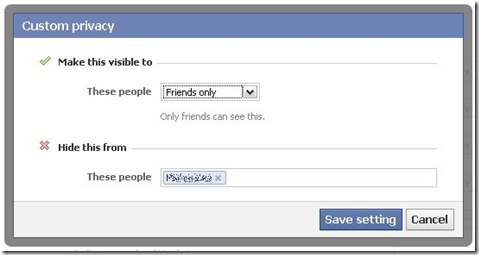 Go to Account >> Privacy Settings. This would take you to a page which shows the summary of current privacy controls in place. Here you can configure what you want to show to who. Following will be just an example and you can customize everything in the same manner as shown. Click Customize to go to the individual controls page. 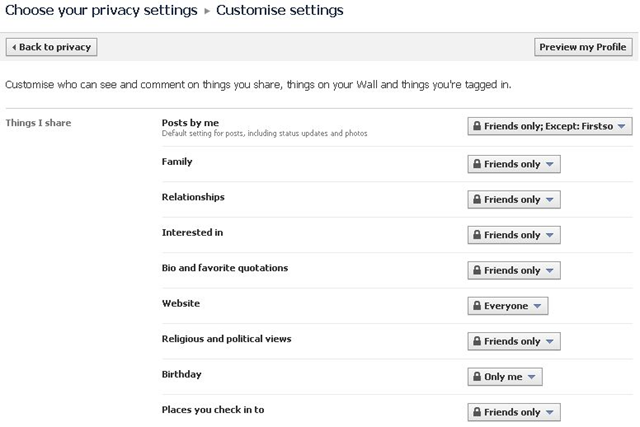 Here you can Customize privacy controls for Things shared by you and others and contact related details. The following examples shows it only for posts. Rest can be done in same way. Click on the tab to open the drop down and click edit to customize. This brings up the following popup. Here you can select the setting from the drop down for who to show and to hide the updates just type in the friends name or the list name in the below “Hide this from” section. Save settings and you are done. This same can be done of all kind of updates. Facebook on Tuesday debuted a step-by-step online guide aimed at helping small businesses use the social networking site. The company is billing the new webpage, found at Facebook.com/business, as an “online education center” that gives directions on such things as how to set up a profile page, create targeted ads and deals, and interact with customer feedback online. Facebook’s new business webpage does not come along with any new features — it simply puts a lot of information that may be handy for small businesses in one place. Perhaps most importantly, it serves as a nicely timed reminder that unlike Google+, Facebook encourages companies to use its service for company branding. Zynga, the online game developer that made Facebook a safe haven for desk-bound farmers and wannabe Mafia hit men, has decided to cash in on all the fun with an initial public offering filing Friday that expects to raise $1 billion. But the filing also confirms that it is not all fun and games at the 4-year-old company, which has 2,000 employees and boasts 60 million daily active users. There’s a big differentiator from some other red-hot tech IPOs that have exploded in value on their first day of trading in 2011. They make money. About $90 million on revenues of nearly $600 million last year. Zynga hopes to raise as much as $2 billion in a public debut that could value it at as much as $20 billion, “people close to the deal” told the Wall Street Journal. This probably will not be a game of chance for Zynga, what the prevailing “What dot-com bust?” attitude on Wall Street for internet, tech and similar IPOs. Chief Executive and founder Mark Zuckerberg told reporters in a visit to Facebook’s Seattle office on Wednesday that the company planned to “launch something awesome” next week. He said the project had been developed at the 40-person Seattle office, Facebook’s only major engineering center outside of its Palo Alto, California headquarters. There has been speculation in technology blogs in recent weeks about various mobile products in development at Facebook, including the release of a long-awaited Facebook app for Apple Inc’s iPad and a specialized app for photo-sharing on the iPhone. Facebook’s Seattle office has made a mark on the company’s mobile efforts, playing a central role in the development of Facebook’s unified mobile site, unveiled in March. Social networking giant, Facebook has made an announcement that it would be rolling out its latest service, Facebook Credits. The bigger news here would be that the service has been launched in 11 countries, including India. Starting from July 1, 2011, Facebook Credits intends to be used as an alternative payment option on the social networking giant. The payment option would be supported by Live Gamer. Facebook credits would allow users to buy virtual currency and virtual goods that are being made available to them in their Facebook apps. The only hiccup, possibly here is that the credit service doesn’t allow payment in Indian Rupees, at least for now. Therefore, users would have to purchase 50 credits for $5. Everyone you know is on Facebook, and most people have added their resume information. But you can’t search by companies and even searching within your friends for company names is virtually impossible. So if you want to research which of your friends work at a specific company, or which friends of friends do, you head on over to LinkedIn. 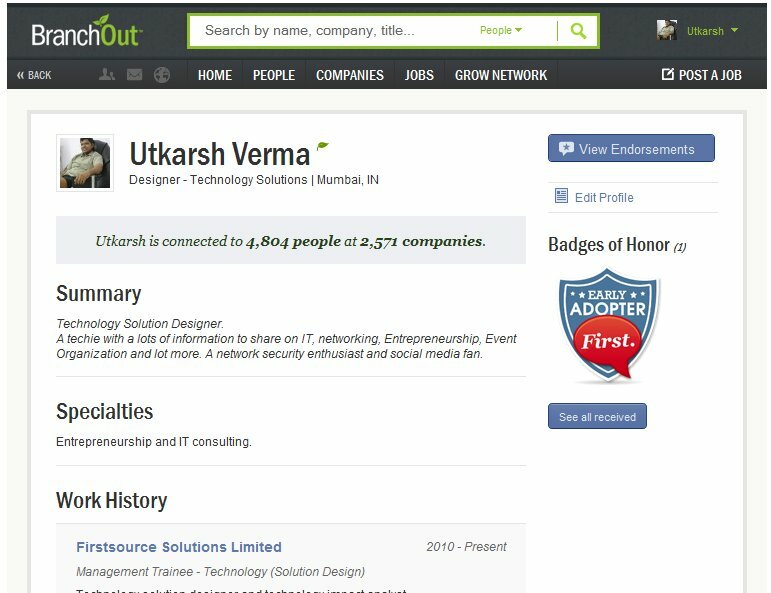 BranchOut launched this evening, a new Facebook application that makes career networking a snap. The application unlocks massive amounts of career data about my friends and friends of friends that was just impossible to get to before. 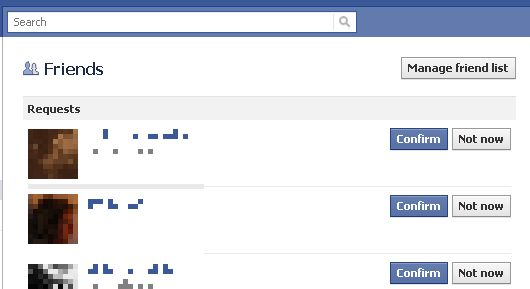 Search on a company name and see which of your Facebook friends work there (or used to). If those friends have installed the app, you can also see how many of their friends have worked at that company. You can then reach out to them for an introduction if you like. The application also has job listings, currently free for thirty days to your direct network. Soon, says founder and CEO Rick Marini, they’ll let people put up job postings that reach all users, for $30/month. Given who’ll be using this, that should be a no brainer. We’ll certainly list TechCrunch jobs there. Test it out and let us know what you think. Facebook, the dominant internet social networking company, is making plans to go public early next year at a vertigo-inducing valuation of over $100 billion, CNBC reported Monday. The Palo Alto-based web phenom could file registration papers with the Securities and Exchange Commission as early as October. In January, Facebook said it expected to cross the critical 500-shareholder mark this year, and if it finishes 2011 over the line, it must file quarterly and annual reports with the SEC within 120 days after the end of the year. At the time, Goldman, which had invested $450 million in Facebook, said the company was worth $50 billion. Today, Facebook is trading at an implied valuation of $80 billion on private, secondary markets like SharesPost, where employees and early investors sell shares to “accredited investors,” including banks and individuals worth over $1 million. Employees at Facebook, the famous social networking site, are the youngest and most stressed out workers in US tech companies, but are considered to be the most satisfied. On the other hand, Google staffers are the best paid within the technical market and have low levels of stress. Of course it’s no wonder their staff are so relaxed, Google provides every employee with gourmet meals, massages, game rooms and other perks that aren’t found in most offices. In January, Google employees were given a $1,000 tax-free bonus and 10% pay rise in order to stop staff from defecting to Facebook. Large scale tech companies are paid well into the six figures-no surprise considering all the well-paid engineers there are on staff. Also, the workers are paid 23% above the typical pay for the same type of work at a ‘normal’ tech company.